Which countries are worst affected by tax avoidance? 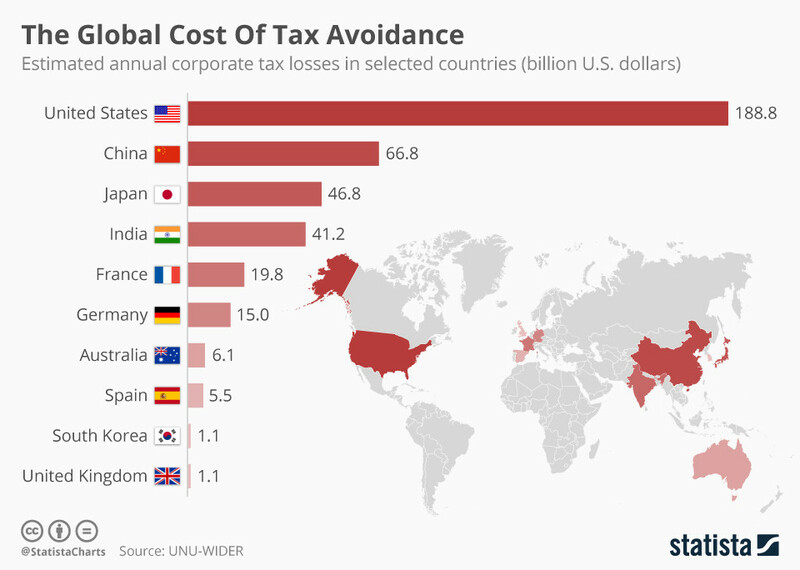 Tax avoidance is a global issue. What would you do with $500 billion? The first challenge might be actually getting your head around quite how much money that is. If you like to travel in style you could buy 1,150 Airbus A380s, according to the published Airbus list price. If you just wanted to show off, you could cover a football field to a depth of 1.5 metres with cash. Who’s hardest hit by this lost revenue? Well, it depends how you look at it. Building on an earlier IMF study, the report offers two different perspectives - overall loss estimates, and losses as a percentage of GDP. In terms of overall losses, you probably won’t be surprised to see some of the world’s biggest economies at the top. Given the size and strength of their economies, they’ve racked up significant losses. The US loses an estimated $188 billion every year, with China a distant second at $66.8 billion. This chart from Statista gives a snapshot of the situation in some of the world’s major economies - all totting up losses of more than a billion dollars. The chart below shows the countries worst affected as a percentage of GDP. In contrast, the figure for the US is 1.13%, and for China just 0.75%. Again, it depends on how you look at it. Overall losses have increased - especially in OECD countries - since 1980, as this chart from the report shows. However, the situation does look different as a percentage of GDP. Using this measure, a much more varied picture emerges. The OECD’s BEPS project has been working on this issue since 2013. More than 100 countries and jurisdictions are currently working together to tackle base erosion and profit shifting (BEPS). The 15 point action plan aims to “close gaps in international tax rules that allow multinational enterprises to legally but artificially shift profits to low or no-tax jurisdictions”. The OECD says that the project is especially significant in developing countries - those most affected by revenue loss, as the UN-WIDER report makes clear. It aims to engage them in the global tax agenda to make sure their needs are met. The issue was also on the agenda at this year’s World Economic Forum Annual Meeting in Davos. The session ‘Taxation without Borders: A Fair Share from Multinationals’ looked at the action needed - particularly in the wake of the leak of the Panama Papers, which exposed the use of tax havens around the world.